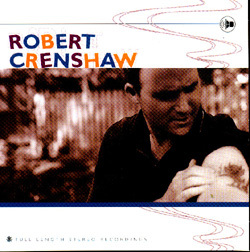 Robert Crenshaw "Full Length Stereo Recordings"
With a singular pop/rock sensibility, polished production, and a voice to carry it off, Robert Crenshaw emerges from his native Detroit with his debut CD, "Full Length Stereo Recordings" -- a collection sure to win over fans on the first listen. From the snap, crackle, and pop of the opening cut, "All I Want To Do Is Be With You" through the other 8 originals, and even a cover of Burt Bachrach's "This Guy's In Love With You," Crenshaw confidently rips through a set that ranges from ballads to rockers, and everything in between. The younger brother of pop/rocker Marshall Crenshaw (who provides occasional backing on the new CD), Robert Crenshaw played in a number of bands around the Detroit area before joining Marshall's band as the drummer and background vocalist through the first five critically-acclaimed releases. After taking a short hiatus from the music business, he's returned to take center stage with "Full Length Stereo Recordings." "My first thought for a title for this record was "Ars Gratis Artis" (Art For Art's Sake). It was made by people who have never recorded before, and by people who have worked on giant records for giant bands. Some of the songs were written for this project and others are 20 years old songs that I felt deserved their day in the sun. It has truly been a labor of love for me. I hope you enjoy it. I truly have."